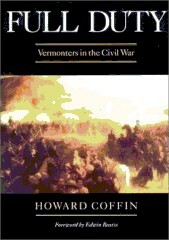 Howard Coffin is a seventh generation Vermonter with six ancestors who served in Vermont Civil War regiments. He has given more than 300 talks on the Civil War in Vermont alone, and leads tours of Civil War battlefields. A member of the Vermont Sesquicentennial Commission, he was appointed by the U.S. Senate to the Civil War Sites Advisory Commission and served on the boards of the Association for the Preservation of Civil War Sites and the Civil War Trust. Long involved in historic preservation, he delivered the keynote address dedicating the Vermont Monument on the Wilderness Battlefield. Coffin and Vermont U. S. Senator James Jeffords led efforts to add 500 acres where the Vermont Brigade fought to the Fredericksburg and Spotsylvania National Military Park. His books include Full Duty: Vermonters in the Civil War; Nine Months to Gettysburg; The Battered Stars; and Guns Over the Champlain Valley and Something Abides: Discovering the Civil War in Today’s Vermont. Coffin lives in Montpelier, Vermont. Howard Coffin leads two tours with Green Mountain Tours this season. We’ll travel from St. Albans, Vermont down the Champlain Valley to Larrabee’s Point. We’ll then take the Carillon Cruise past Fort Ticonderoga and Crown Point to end up at Basin Harbor. We’ll have a rare view of the route taken by the Americans who fled Ticonderoga seeking independence in 1777 with the British in close pursuit. We’ll visit the Macdonough shipyard in Vergennes, Vermont, where ships were built for the American Revolution. We’ll enjoy commentary by Howard Coffin, and discuss his book ‘Guns Over the Champlain Valley’. The tour includes lunch at the Basin Harbor Club, admission to the Carillon Cruise, and transportation. The Confederate Raid on St. Albans, Vermont on October 19, 1864 was the northern-most land action of the Civil War. During this one-day tour we’ll see the St. Albans Museum, and then walk about the town where a force of 22 rebels stole more than $200,000 from three banks. We’ll see the hotels where the raiders stayed before the assault and many other sites. Then we will drive north through the beautiful farm country of Franklin County following the route of the raiders on their escape to Canada. At Sheldon, we will stop at the covered bridge that the Confederates tried unsuccessfully to burn down. We will see the site of another bank the rebels tried, but failed to rob and the home of the Vermont soldier whose horse was stolen by them. We’ll follow the raiders across the Mississquoi River at Enosburg Falls. We will also discover a connection between the raid and General Robert E. Lee. In addition to to the commentary by Howard Coffin, the package includes admission to the St. Albans Museum, lunch and transportation. Howard Coffin has delivered more than 400 lectures on Civil War history, throughout Vermont and at Gettysburg, Fredericksburg, Charleston, and other historic locations. Coffin’s subjects include Vermont at Gettysburg, the Battle of Cedar Creek, Lincoln as Commander and Chief, Vermont Morgans in the Civil War, Vermont and Human Freedom. He also lectures on military sites along the Champlain Corridor that include Ticonderoga, Saratoga, Plattsburgh, Bennington, Crown Point and others. In addition, Howard is listed in the catalogue of The Vermont Humanities Council Speakers Bureau. Howard Coffin’s signed limited edition prints depicting the Second Vermont Brigade’s attack on Pickett’s Charge at Gettysburg are available online. A professional artist designed the print and Coffin has written a text. These beautiful and colorful prints, with map, battlefield photo, and portraits of key military figures, are suitable for framing. Coffin signs each print, personalizing them if requested. $35.00 per print plus $5.00 shipping. Contact him here to order prints.